When I started my second year of teaching I slowly began to see that I could find things on Pinterest besides DIY projects, recipes, and cute outfits. I could find ideas to for the music classroom. Now, there weren't a ton of music education pins back then, but there were some really great ones that gave me fresh ideas to bring to my music room. Now, my music Pinterest boards are so many things. If you have never used Pinterest before, you really must check it out! You can search for pins or boards using the search bar, and follow any person or board that interests you. 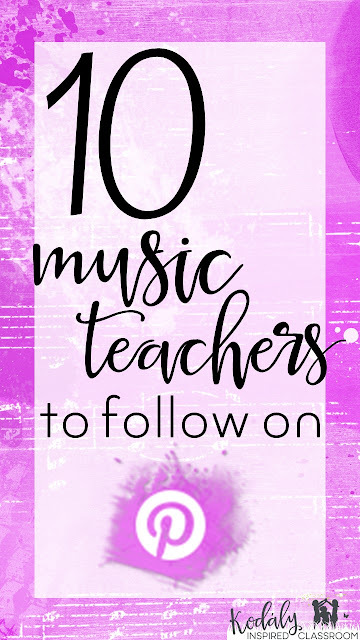 If you are looking for some new boards or music teachers to follow, check out this list and you will see some of the best resources for elementary music teachers. That's my Pinterest page! 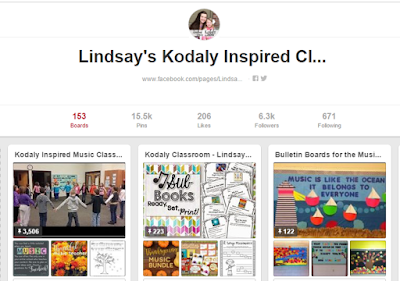 Check out my favorite boards, Kodaly Inspired Music Classroom, where I pin my very favorite ideas for my classroom as well as resources I have created, and my board, Children's Literature for the Kodaly Music Class. I love Aileen's board, Music Education Games, which is full of games for the Kodaly Inspired Classroom. You should also check out her Music Centers board. It has so many great ideas and resources to help you attempt centers in the music room, which is something I would like to gradually do more of. Amy has a lot of great boards. My personal favorites are her Music Education Blogs which links to tons of her amazing blogs posts and her Elementary Music - Listening board which has tons of great links and videos for listening lessons. I love Cori' Classroom Organization and Storage board! It is filled with a lot of little tricks to help you keep your space organized. You should also check out her Music Listening board to see some of her amazing resources to incorporate more listening into your music lessons. Be sure to check out her board, Mrs. King's Music Class. This links to a lot of her blog posts and products. You should also follow her Bulletin Board Ideas. Now, she is the Bulletin Board Lady after all, so she doesn't just have one board for bulletin board ideas. She has pinterest boards full of pins for back to school, composers, and every month of the year. There is no shortage of bulletin board ideas here. When checking out Jena's boards, be sure to follow Music Class Ideas, which includes all kinds of ideas to try to incorporate into your music classroom. I also have gotten a lot of great ideas from her Technology in the Music Classroom board. If you aren't already following David, you probably just need to go ahead and follow all of his boards. They are seriously chalk full of some of the best ideas out there! First you should visit his My Classroom board to get a peek at what he is doing with his kids. I also love his board for Teaching Form. So many great ideas! Check out Sara's board Music With Sara Bibee to see all of her amazing resources. You might also love her Elem Music board. It has some great videos of singing games! If you visit Elaine Ford's pinterest boards, scroll down a bit to find her music ed boards. She has a great board called Classroom Ideas that is full of music classroom organizational and decorative pins. So much inspiration! I LOVE LOVE LOVE her board Music & Literature. I've already found some new books to add to my wishlist from this board. Brittany's boards look super organized and her board covers make it easy to find anything you might be looking for. My personal favorites of her boards are Melody Concepts and Rhythm Concepts boards. I hope that gives you lots of boards and/or music teachers to follow on Pinterest! What would we do without Pinterest? Thanks so much for the shout-out! This is a great list (and I realized that I wasn't following Sara, Elaine, OR Jena...how did I miss that?) Thanks again! No problem! There were a few I realized I hadn't been following too!